USGS says human activity is increasing U.S. earthquake risk. On Monday, for the first time, the U.S. Geological Survey has released an analysis of the magnitude of “human-induced” earthquakes. That such a thing as human-induced earthquakes can exist is scary enough, but the “dramatic increase in seismicity” in places such as Oklahoma has forced the USGS to consider the threat more broadly. 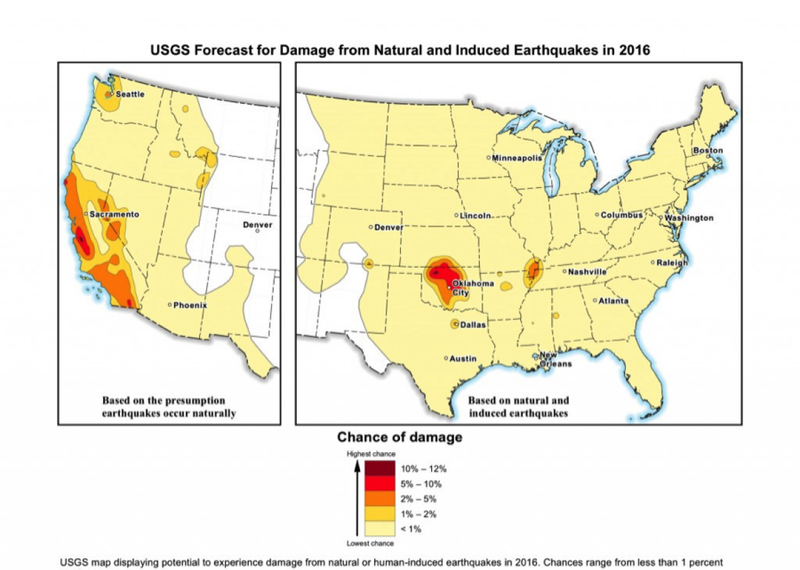 “By including human-induced events, our assessment of earthquake hazards has significantly increased in parts of the U.S.,” said Mark Petersen, chief of the USGS National Seismic Hazard Mapping Project, in a statement. “This research also shows that much more of the nation faces a significant chance of having damaging earthquakes over the next year, whether natural or human-induced.” The USGS also released its first-ever one-year earthquake hazard outlook on Monday, taking into account the current impact of fracking and wastewater injection (part of the oil and gas recovery process). So, not only do we now have overwhelming proof of the effect of the oil and gas industry on earthquake risk, but we have a prediction that increased seismic activity will continue until practices change. For now, that means that Oklahoma bears a risk of earthquakes on par with California. In fact, Oklahoma is now one of the most seismically active places in the entire world. Recently, the state’s Republican governor, Mary Fallin, allocated funds to increase monitoring of the earthquakes, and the state’s Corporation Commission requested well operators to reduce the amount of wastewater injected below the surface. The state also launched a website, earthquakes.ok.gov, to discuss the threat. It’s difficult to overstate just how rapidly this threat has emerged. 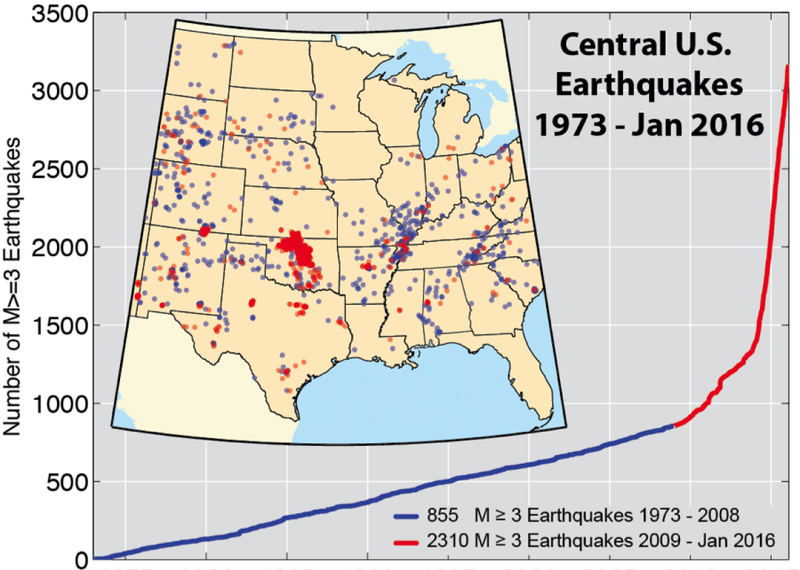 Between 1882 and 2012, there were just 232 earthquakes of M3.0 or stronger in Oklahoma, the threshold above which earthquakes can generally be felt. So far in 2016 (as of Sunday), there have been 287. The frequency of these earthquakes has increased more than twentyfold in just the past four years, and the biggest so far—a M5.6 in 2011—destroyed homes, buckled highways, and spawned a New Yorker feature. The Oklahoman has devoted a special section of its website for coverage of the quakes. Natural earthquake risk in places like California still far exceeds the risk of man-made earthquakes. But the USGS estimates that 7 million people are now at risk of human-induced earthquakes, and it says that there’s no firm evidence yet on whether these earthquakes have an upper limit in strength.